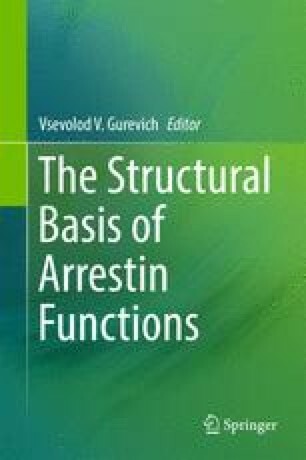 To better understand the molecular mechanism of arrestin-mediated signaling, detailed structural information on the arrestin-receptor complex is necessary. Biochemical studies provided some information about how arrestins are recruited by active receptors. The X-ray laser crystal structure of the rhodopsin–arrestin complex reveals unique structural features, which include the asymmetric binding of arrestin to rhodopsin. Arrestin adopts the active conformation, with a ~20° rotation between the N- and C-domains of the molecule, which opens up a cleft in arrestin to accommodate a short helix formed by the second intracellular loop of rhodopsin. Rhodopsin–arrestin complex gives important insights into how G protein–coupled receptor signaling is terminated by arrestin and reveals structural basis of the mechanism of arrestin-biased signaling.